Migration watch; 06.45 – 11.35hrs. Highlights were a 2CY PALLID HARRIER that flew north at Long Nab at 09.10hrs, the first record for Scarborough. 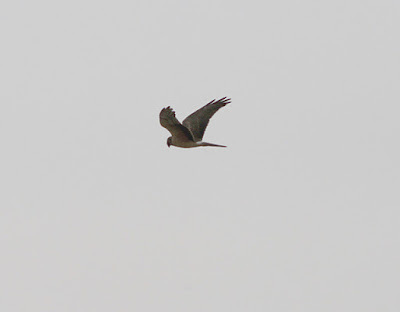 Amazingly the same bird was seen some 25 minutes before passing northeast at Wykeham South Lake, a distance of 7.25 miles and a rate of travel of about 17 mile per hour! 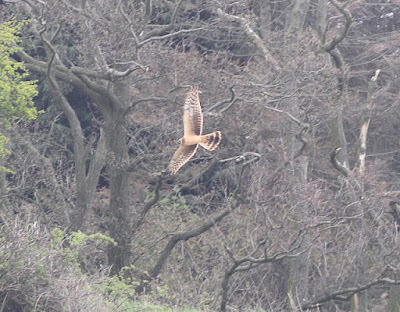 The second Scarborough rarity and only the 3rd modern day record was a STONE CURLEW seen flying round calling over fields on Seamer Mead at 09.30hrs, unfortunately despite searching the area later in the day it wasn’t relocated, however seen there during the day were 21 Whimbrel, a Short-eared Owl, a Little Egret, 2 Wheatear, 6 Sedge Warbler and a Grasshopper Warbler. Also on the move at Long Nab (south unless stated) were 2 Shelduck, 1 Red-throated Diver north, 1 Shag north, 4 Ringed Plover north, 1 Little Ringed Plover north, 3 Great Black-backed Gull north, 3 Lesser Black-backed Gull + 1 north, 29 Sandwich Tern + 3 north, 3 Swift, 9 Sand Martin, 111 Swallow, 13 House Martin, 1 Flava + 1 north, 17 Linnet and 7 Goldfinch. At Wykeham South Lake there were 8 Pochard, 2 Gadwall and a Wheatear.